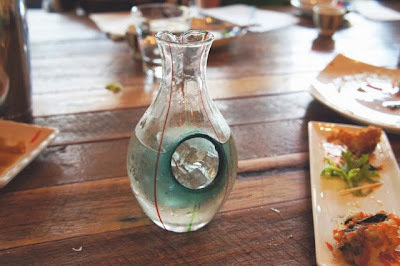 Disclaimer: I did not pay for my meal, Pabu Grill and Sake hosted a media dinner. The opinions reported below are based solely on my thoughts at the time of my visit. Pabu is a sensible Japanese dining option on Smith Street, Fitzroy, if you want to get your sake on and feast on the affordable. 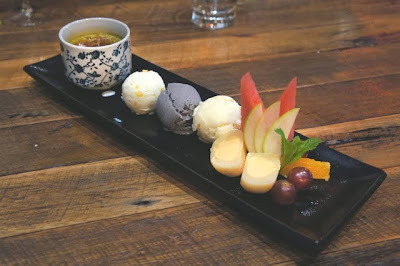 I visited a little while back as a guest of the owner, Khoa Nguyen, who gallivanted around Japan eating at the best restaurants before opening his own here in Melbourne. The food is decent, but perhaps not what you’d expect from someone who spent time researching at top eateries in Japan. It is, however, exactly what you’d expect from a Sake Master who has learned the art under Maedaya’s Toshi Maeda. Pabu, which means pub in Japanese, draws inspiration from izakayas, although inspiration is where it ends. Pabu is much more contemporary and has been modified to suit Melburnian tastes. After our meal I took that to mean ‘goes down well with booze’. It took nine months to transform what was once an old shop lot into Pabu Grill and Sake. The space was designed by EAT Architects. Recycled timber and raw brick contrast against steel finishes and add a touch of Collingwood grunge, while the Japanese mural of cranes against a mountainscape comes from Hiroyasu Tsuri of Two One Elephant. Pabu has its own touch of personality, evident in the floating abacus on the ceiling with orange highlights, framed vintage Japanese posters, vibrant traditional pottery and a collection of designer light fittings. 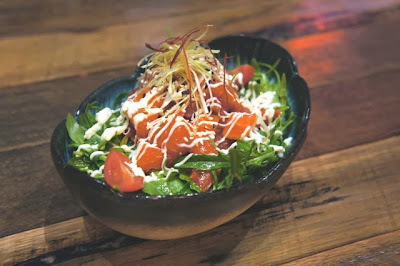 Dud number one: the maguro and sake salad. 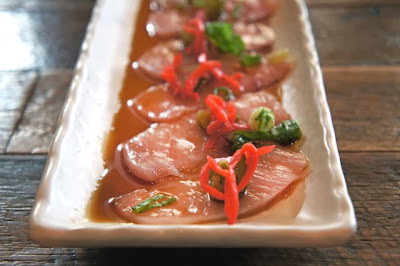 If anyone thinks glistening salmon sashimi pieces and maguro – deep pink chunks of tuna sashimi – can swim in that amount of sesame soy dressing, they’re forgetting the fish are dead. 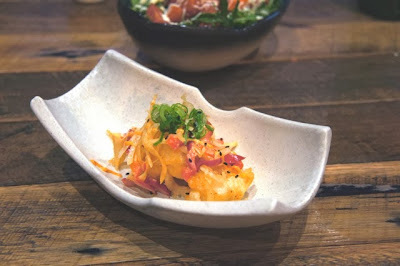 The rocket was wiry and gritty, and like a few of the dishes at Pabu, it suffered from what I like to call OKMS: overzealous kewpie mayonnaise squirting. Not even the crunchy, deep-fried shards of lotus root could pull it from the depths of disaster. Dud number two: buta asparagus. This was unfortunate, as the skewers had plenty of potential. 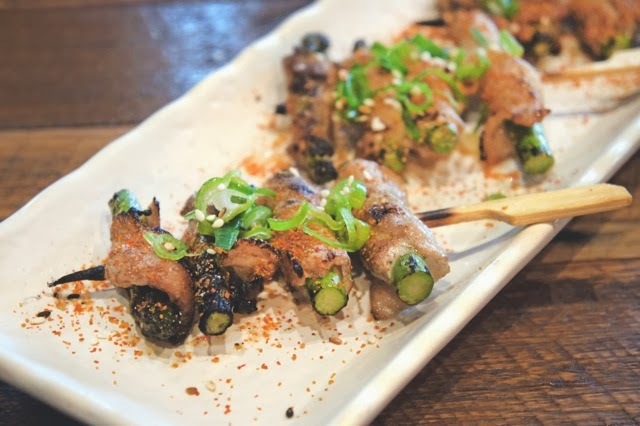 It’s possible that the unevenly cooked pork belly slices wrapped around fibrous asparagus (the kind you have to subtly spit out, they refuse to be chewed) fell victim to the smoky, charcoal grill. Aside from the above, things started off tremendously. We snacked on addictive slices of lotus root that had all nutritional value zapped out of them by the deep fryer, with salty edamame to balance the guilt. 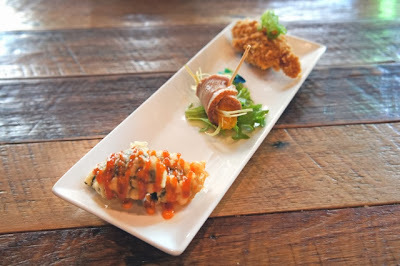 A tasting plate of kaki fry (a deep fried, panko-crumbed oyster), kamo tataki (sliced duck wrapped around a plump orange segment), and a stunner of a deep-fried miso scallop (kaibashira) set the bar high early on. Ebi capsicum aye tiger prawns in a light tempura batter were moresome mouthfuls mixed with finely chopped onion, capsicum and, unfortunately, another serious case of OKSM. 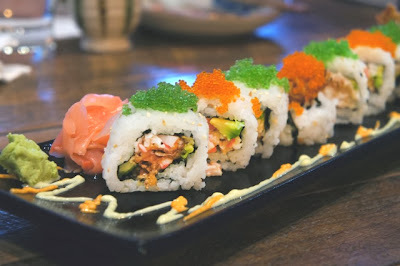 Soft shell crab inside-out sushi rolls with cucumber and avocado arrived sparkling with popping tobiko. The fluorescent orange flying-fish roe alternated with a wasabi-dyed green version. It hit the spot, as sushi often does, but the rice could have been cooked a touch longer. Nasu dengaku, one of my favourite Japanese dishes, was baked then grilled and slathered in the sweet, buttery miso sauce I'm so fond of. 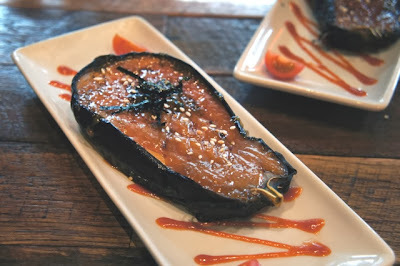 Eggplant is so underrated. You’ve heard of the raw food trend, right? Well Japan has been dining raw since before it was cool. They do it best, as the dishes of the night exemplified. 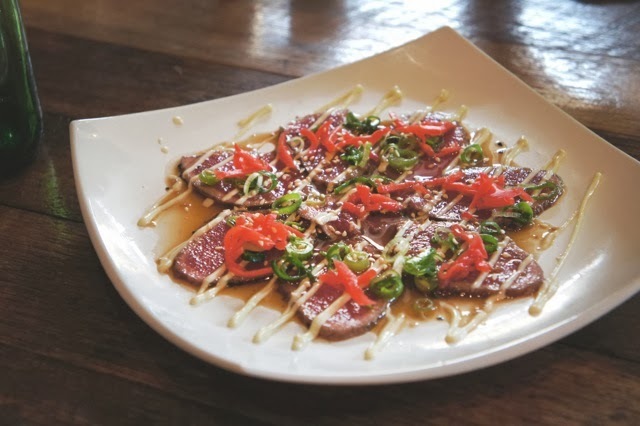 Beef tataki with a seared permitter and zesty citrus and soy sauce was so fresh it could have passed as tuna sashimi, while hamachi kingfish slices with ponzu and white radish turned to Mexico with the addition of sliced jalapeño. 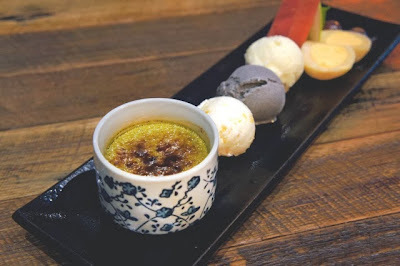 It ended with a velvety green tea crème brûlée, backed by a row of citrus sorbet, black sesame ice cream and a scoop of vanilla. Throw in a frozen melon mochi rice ball and a few slices of fruit and you’ve got yourself a Japanese dessert platter. The brûlée could have done with a touch more matcha. I’m a strong believe that you can rarely have too matcha, matcha. Every dish we sampled was paired with sake in gorgeous bottles. I’m not going to pretend I remember which is which, but rest assured your Sake Master will be able to make recommendations. The menu comes with pairing suggestions, too. I’ll admit I’m hard to please when it comes to Japanese. 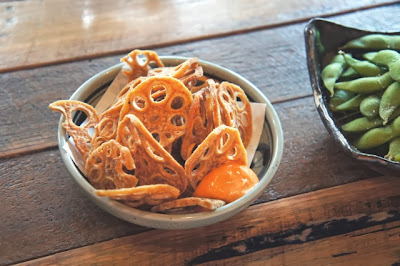 After an incredible trip there last year, my standards skyrocketed when I realised we really don’t have much in the way of authentic Japanese dining here in Melbourne, except for my favourite place North of the river. But Pabu isn’t trying to be authentic; it’s trying to provide a solid, contemporary Japanese dining and drinking den for groups and couples alike. And with the exception of a couple of iffy dishes, it succeeds. 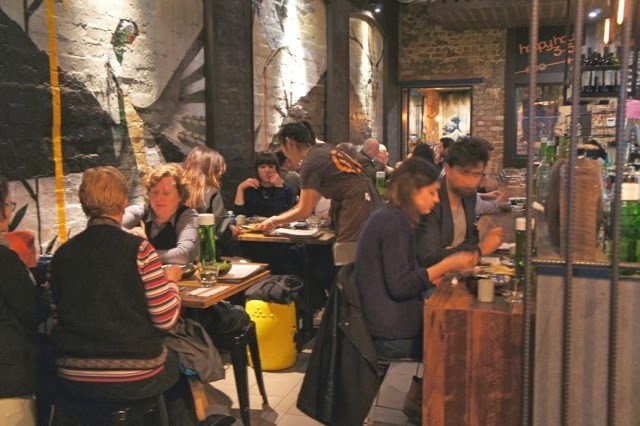 Where is you favourite Japanese joint in Melbourne? Let me know in the comments below! My uncle's wife is a Japanese so I think I must tell him about this one. She shall be very happy to see this place and feel nostalgic.